Read Matt. 25:14-30: Take a look at, “You wicked, lazy servant!” Now, what is the meaning of unfaithfulness? Have you ever considered that when we are stingy with the resources God gives us we are being unfaithful? That we are betraying His trust, letting down our Lord and Savior? Look at it this way, greed, stinginess, selfishness, and miserliness are the rotten fruits, because we hoard what God has given us, what He meant for us to share. We do not use properly as Christ has given and called us to do. This blocks the flow of God’s blessings and His “living water” from flowing in us. We will become stagnant and useless to either the Kingdom or the people around us. Pride and arrogance will be the driving force-the quintessential things that God hates the most (Proverbs 6:16-18)! When we are just stingy we are being self-seeking, we are selfish and unconcerned with eternal values or with serving our Lord. By doing this, we fall into a trap, because we are not doing as we should. As a result, natural consequences will take over. God’s precepts are for our benefit and protection; He gives us what is best for us, and we are to pass it on, just as loving parents would do for their child. By not placing ourselves first, we are able to place Christ first and we end up with a better deal. We can seek the His love, and this will compel us to share our richness as Christians with both ourselves and with others. So, out of our completeness in Christ, we can build ourselves up in Him, casting away what has hurt us, what causes us to fear, and what is wrong, replacing it all with biblical stewardship and values. This will be laid on the foundation upon which to create the lasting bonds with Christ and others, as we glorify our Lord and live in and for His Church (Prov. 10:12; Matt. 6:33; John 12:24; Eph. 5:15-21; Phil. 2:21; Col. 1:13). Stewardship is the wise use of our materialistic goods and abilities, as well as with our time. Wasting time and resources and not sharing, in the eyes of the Puritans, was a sin, and that notion did not originate with them, but with God’s Word. Read Psalm 24:1; Acts 20:35; 2 Cor. 9:7; James 1:17: What are the standards for stewardship we are to have? Stewardship recognizes that we, as Christians, as well as everything in creation, belongs to God. Stewardship is proportionate to what we are able to give. The poor person’s small gift is just as important as the rich person’s big gift! Sometimes, we cannot give as much as we would like to, due to economic realities, job loss, business not good, sickness, in fulltime ministry etc., so, we give honestly and efficiently whatever we can. Stewardship is the giving of ourselves and our resources with joy and gratitude for what we have been given. Stewardship is not something that results from a forced obligation or a bad attitude. Giving should always be cheerful! If it is not, then you are not really giving–are you? When a Christian is giving from selfish motives, he or she expects a return for his or her “investment.” When a real, growing, mature Christian gives, he/she expects nothing in return. One investment is eternal, while the other so-called Christian investment is about the world of just for today. Thus, a key aspect of stewardship and love means we are not selfish. How do we know if we get this right? If you do not care for others outside of your circle, then you are demanding your own way because your pride is in the way of His Way, and sin is on its way to you and from you! Our lives will be a false dedication to things that are not centered upon His will. We cannot earn our way, but our way must reflect His work (Rom. 6:12; Eph. 5:15-17; Col. 3:5; 1 Pet. 2:24)! Generosity is the realization we have His living water flowing in us. To keep it fresh, it must flow out of us, too (John 4; 7:38)! This is like the Dead Sea in Israel, which is a dead body of water that has little to no life in it. There is no life in it because it has no outlet. It has a river flowing into it, but the water remains there, and becomes stagnated with harsh salts and minerals to the point that nothing can live or grow there. When we are stingy, we become like the Dead Sea–stagnant and lifeless. The living water within us will quickly become stagnant, like a mud puddle with mosquito larvae growing in it, useless, and even dangerous. Is the Character of Generosity working in you? A selfish Christian or a self-centered church that does not give, and only sees themselves as a charity, will become a Dead Sea rather quickly. How sad and pathetic that would be–an unconcerned, uncaring, and self-absorbed quandary to the neighborhood, and a disgrace to the Kingdom! The lack of Generosity will reflect a lack of faith and obedience! If you think there are no rivers coming into you, then seek what is blocking them. Is it sin, attitude, fear….? God blesses those who steadfastly embrace His call, and who stay true to Christ. We need to stop looking for approval from society, and seek His approval. True Character will be the fruit of our encounter with Christ and the endeavor of how we are with others around us! Generosity is actually a ‘Fruit’ of the Holy Spirit that gets a hold of the real believer; thus, this action will inspire one to be more charitable to others. This allows us to give to others because God has given abundantly to us. It is also the wise use of stewardship and the proper attitude that all possessions belong to God. Since, we are merely the caretakers for His stuff, we can properly manage and re-purpose for Christ’s purpose. This Fruit encounter will see the Lord as the Source of true blessing, not our selfish desires. Basically, God wants us to get rid of Stinginess, and is a person of character who in endowed by the Fruit of the Spirit so we can exhibit and practice Generosity. What happens when we are not generous? What are the opposites of God’s call?Greed, Stinginess, Selfishness and Miserlinessare the fruits of the flesh that cause us to be ‘possessed’ by our possessions, stopping us from being a blessing and of use to God and others. These rotten fruits ‘rot’ because we hoard them and do not use them properly as Christ called us to do. This blocks the flow of God’s blessings and ‘living water’ from flowing in us. We will become stagnant and useless to the Kingdom or the people around us. Pride and arrogance will be the driving force, the quintessential things that God hates the most (Proverbs 6:16-18)! 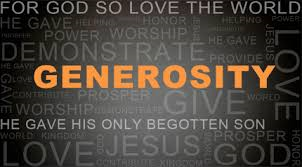 Generosity is also an act of worship–to model Christ, and see the big picture that goods and material things are not important, but relationships are. This goes to giving back to God, providing to those who have less, and making sure your church is modeling this character. One of the things I both love and hate to do is go out to lunch with a bunch of fellow Christians after church or Bible study. I love the fellowship and conversation; but, when it comes to tip time, I, as the pastor usually ends up paying the tip or make up the rest bill. Then, hear complaints from waitresses about how stingy the various church groups are! When will we learn, as a Church, that our actions enable us to point others to the way to the Lord, and give us the ability to repel others from Him! View your promise to give to God that which is referred to as your tithe, like an income tax. Although it is not mandatory, it is a reflection of your character and response to His grace. As the government so nicely swipes away your hard–earned money from the top of your paycheck, consider joyfully setting also the top 10% of your net, or better yet, the gross income, for the Lord’s service– before the bills, expenses, and entertainment. Do not include the tithe in your budget. Make your budget on the net assets you have after the tithe and taxes. Then, you will have a more realistic budget and keep yourself from getting into debt. That way, it is done and out of the way. Then, carefully decide to whom it should go. The primary responsibility is first to your local church, and second to ministries that are doing the Lord’s work. Remember, the people who set aside the first fruits of their resources to God are dedicating themselves to God, and not themselves to themselves. The tithe was fair and is still fair today. Every one is on the same playing- paying field. So the rich paid more and the poor paid lees. If our taxes worked that way we would have a balanced budget and be a nation out of depth and not even have to pay income tax, if we went to a 10% national tax on all goods and serves sold! All you have to do is divide 10% from the gross national product and compare it to what the IRS gets annually and what the national depth is. (Reference and History from “History of the Christian Church” by Schaff; “A History of Christianity Vol. I &II” by Latourette, “The IVP Bible Background Commentary,” by Keener, and “The Oxford Dictionary of the Christian Church”)!